Georgia Napolitano was born in the spring of 1992 in Milton Keynes, England. By the age of 18 she had sung the U.S. National Anthem to 40,000 people at Fenway Park in Boston, MA; launched two charities, released an EP with a Grammy winning producer, and took the crown as Austin, TX Idol. The mayor even proclaimed November 19th, 2009 as Georgia Napolitano Day in Austin. 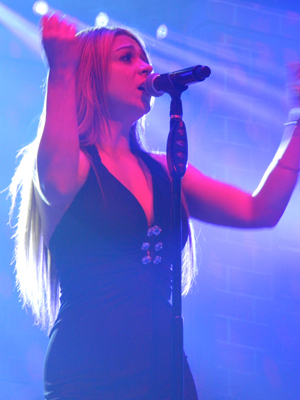 Continuing in her pursuit of a musical career, the year 2010 would be a life-changing one for the petite singer with a voice much larger than her frame, as Georgia was contacted by Trans-Siberian Orchestra. In just a few short years, she has toured six times in the U.S. and Europe performing to millions of fans, and has a lead vocal credit on a Billboard Top 10 TSO release! In my 2012 interview with TSO creator and producer Paul O'Neill he shared this example of Georgia's talents: "This goes to just how great Georgia is by the way, when she first joined she came on to play the Mom, and everyone in TSO is supposed to back up everybody they can, and at the last second we were having troubles with “Queen of the Winter Night” and Georgia, who I didn’t even ask to learn it, had learned it, backed it up, and nailed it." During the middle of 2013's The Lost Christmas Eve tour I chatted with Georgia about her musical upbringing, artists that inspired her to sing, where she gets her inspiration from when performing, a personal and emotional performance from this tour, the thrills of the TSO stage, fans, her own music, and her mom's way of keeping her grounded. Georgia: Thank you so much. I appreciate it. I love being here. Bp: Last night was a pretty packed show in DC I hear. Georgia: It was. It was amazing. It was quite intimidating. I still get really nervous so when I was standing on the stage realizing how big the arena was and how the house was just packed, it made me get a little bit nervous. [laughs] It was fun, a great crowd. Bp: I was wondering if you could walk through your beginnings, growing up and what led you to start singing. Georgia: Oh my. Well, growing up my dad was always singing and we were very much a music family so always having music channels on, records playing or CDs playing and I don't know, something just completely pulled me toward music. It was in my heart from a very early age. I probably started getting a bit more serious when I was about 6 or 7 when we first moved to Austin, Texas [from England]. I started off doing musical theater and being in all the school plays and stuff like that and ever since that moment, I just knew in my heart that it was what I was gonna do forever and it didn't matter how, when or where. It was kind of a decision I had made up in my mind and in my heart so I’ve just been training and trying to take in as much as I can really. Then TSO came into my life about 3 and a half years ago and it's been the biggest, most amazing blessing ever. It's just such a beautiful group of people to be involved with so it's just very special to be asked to be a part of something like that. Bp: Was there a defining moment when you were younger, or a vocalist that made you think, "I want to do that. I want to be on that stage like that singer?" Georgia: From the get go Michael Jackson had me, you know. Michael Jackson was someone that I believed every single word he sang and he made me feel every emotion in the book. I feel like that was something moving forward I just really gravitated towards, singers that made me feel something and really took me far away with them when they were on the stage. So female artists, I definitely grew up with a lot of Celine Dion and all those divas. Then Christina Aguilera for my generation, she really got me because, she…I don't know, she was cool, she had edge, but she also could really put so much emotion behind her words and so she was definitely someone growing up that I admired a lot and looked up to. But it's hard to say, there's so many people I feel that have influenced me. Bp: You were doing home performances and posting them online and you had great success with a number of singing competitions and shows around Austin, but in 2010 you moved to the enormous TSO stage performing in front of thousands of people every night. Was that a big adjustment for you? Georgia: It's really interesting because I was thinking about this the other day. I feel like it's almost more intimidating to share your heart and your words and emotion and let all your walls down in front of three people staring directly into your eyes versus an arena of thousands of people. You just feel like you’re standing there sharing it with so many people and it's such an overwhelming feeling of happiness. I'll never get over the way that is. As far as [adjustments], there are a lot of technical things that are very different, for example, using the in-ear monitors and getting used to the fact that there's fire shooting at you. But there was a lot that went into the rehearsals and adjusting to that size of the stage, I mean it was a big, big jump for me and I think that every tour there's always something else to learn. Especially with Paul [O'Neill, producer and creator of Trans-Siberian Orchestra], since he always is making it more amazing. More fire, more lights and there's always something new to kind of learn. Adjusting to being on a lift and going up loads of feet in the air and doing a dance up there. Those are the things that I really enjoy because it keeps everything so new and so fresh and there's always a challenge in there somewhere. So I guess that was more of the adjustment for me because I do really feel at home on stage when there's a lot of people out there. Even though there's millions of people that have seen the show watching our performance it still has this feeling of comfort and safety. It's still crazy to me, I don't think it's ever gonna sink in, it's one of those things. Bp: How was the scouting or the audition process for TSO? How did they connect with you? Georgia: Well, what happened was my dad videos pretty much every one of my performances - he's my number one along with my other family members, he's been completely supportive of me my whole life and I'm very thankful to have parents and a family like that - he would just always video my performances and put them online or on my website or YouTube and they were looking around for singers that they felt would be able to carry out their story or put certain emotions behind their words. They came across a video of me singing actually one of Christina Aguilera's songs. It was a very special heartfelt song to me and my dad decided to make a little video out of it and post it and I've been told that was the video that they came across. They got in touch with my mom and said, “We would really like to do an audition with Georgia.” So I flew to meet them and sing for them. At the end of that year I started doing the tours and now I'm on my sixth tour and it's crazy how quickly the time's gone by. Bp: What did you sing for them when you auditioned in person? Bp: Yeah, I miss that song too. You've been involved in a number of different roles from the Christmas Eve and Other Stories motherly role to obviously a darker one on the Beethoven tours for “The Dark” and now on The Lost Christmas Eve. How have you approached the different roles? Georgia: Well something that I really like to do is take a song and work out the role and try to relate it directly to something in my life. Whether it be an experience or it be something that I've seen with my own eyes or felt with my own heart because what that does is, it creates something real for me. Because if I think…for example when I'm singing the lullabies and I'm doing more of like a motherly role, I don't have children yet, I hope to in the future, but if I try to think, “Okay, this is me singing to my child,” then the emotion might not come across as genuine as if I think about something that I've actually experienced or something that I have truly felt. So I try and take each role and directly relate it to something in my life and every time I get on the stage I become that character or I'm telling that story I'm thinking of that one thing that's very true to me and very real. That's something that I always hope comes across to people listening, that it's coming from a very real emotion in my heart, not just some…I don't want it to ever be acting, otherwise I would want to be an actress, you know. Bp: You're actually inside the song rather than just performing it as a character piece. Bp: The things that you draw on for those songs, do they change on a nightly basis or is it pretty static? Georgia: There's a couple of things that come up very often for me. There's a few big ones in my life that definitely are there with me every night on the stage. But it can be something as simple as when I'm singing “Different Wings” and I look out into the audience and I see a little child sitting there and they'll be playing on an iPhone, Angry Birds or something, and as soon as I start singing they'll just stop, their big eyes look up and it's almost like…It's such a rewarding feeling to know that you can capture a lot of different people's hearts if you really mean what you say. That's something that's really special about the TSO fans and the audience and everything. There's so many different people out there from all different ages and walks of life so it's really easy to draw inspiration and be honest when you're looking at all these beautiful people in front of you and each person has a different story or a different experience. There's been a lot of people that have totally just grabbed my attention and moved me in the audience and they then become the inspiration for the story or the words and that's a really lovely thing when that happens. It's very special. Bp: You've got a quality about your voice that grabs people's attention and Paul's songs are very specific to his stories, but at the same time universal enough so that people in the audience may not have gone through, say the hardships that are being presented in The Lost Christmas Eve, but you can still relate to it, which is a great quality he has in his storytelling. Georgia: Yeah. And something that I appreciate about him above and beyond all is that he is definitely the most selfless person I've ever known in in my entire life. And I say entire life because even though it's only 21 years, there's been so much that's gone on and I've met a lot of people and he's very inspirational and he's very selfless. In a sense he is never writing for himself. He's never telling the stories because he likes the way the story sounds. He's so intelligent and creative to be able to reach out to so many people from all walks of life and all different ages and still there's something for everyone. That's a really, really cool, unique thing to be able to do. I mean, that's a very rare thing. I'm not sure that I've ever seen such an incredible age range in an audience, so it's very special that he can do that. Bp: Trans-Siberian Orchestra on paper really doesn't make a whole lot of sense, but when you put it all together and you present it as such, like you said, it has such a wide range of appeal from young children to really old adults. It's amazing what’s been put together. Bp: It's something you have to experience. Georgia: Absolutely, definitely a blessing for sure. Bp: When you are tapping into different life experiences or emotions how do you tap into it without drawing on it too much and opening up yourself too much? Georgia: There's definitely a fine line. My whole thing is that I never want to sing for myself cause, you know I can do that in the car or I could do that in the shower, that's fun and that's lovely, but it's so very different when you're singing for everybody else and you're coming from a place of just being very…you know it's very vulnerable being on the stage and letting all your walls down to tap into those emotions or life experiences that some are amazing, some are hurtful, painful, all these things; it's very vulnerable. I think that the line between being too into that one thing is quite fine because for me personally, I don't ever want it to just be like this is MY story and paint it into a corner by putting a very specific type of emotion into a song. ‘Cause some people might hear “Different Wings” and think this is a happy, beautiful story and song and then other people may have tears in their eyes and it might be a very sad song for them. And I think it all just depends on what each person wants to take from it and that's the beauty of music and that's something that I always strive to get better and better at is just singing from an honest place that still allows everyone that's listening to take what they want or what they may need from that song. That's why I think Paul is incredible because he writes that way in a sense that it may be one story to someone and then a completely different story to someone else. I think that's a very special thing to be able to do. Bp: A couple of weeks ago, after the Manchester [New Hampshire] show, you shared with me some of the emotion you tapped into that night, seeing the light up in the upper level and your close friend. I was wondering if you wouldn’t mind sharing that. Georgia: Yeah, basically, let’s see…I feel very safe on stage and a lot of that comes from my angels that I feel are just there protecting me and showing me the light and making sure I'm okay. I really do believe that they're just right there by my side and no matter who you lose in life, if you've experienced loss it's always very comforting, for me personally, to think, “Well that person may not physically be around, but they're even closer now than they were before because they're always with me. They're always right above me, they're always right by my side, they're always watching over me.” So that night was really special because I was singing and I was in the moment and then all of a sudden I had this really overwhelming feeling and I looked, just for a minute it seemed like there was nothing in front of me, like it was just pitch black, and then all of a sudden this really bright shining light appeared in the top right corner of the arena and it felt very much like a way of me realizing that there's always something shining down, there's always something there, there's always something that's there to keep you safe and protected. It was just a very significant moment for me because you know I have lost people that I love and it was very close to a special day so for that to happen in that moment, it kind of took my breath away and the song became that much more heartfelt for me because it was just very…it was almost like a sign. I don't know, it was very interesting and those are the moments that you just never, ever forget and they never...you know, they never wander from your mind ‘cause it's just that safety and that overwhelming joy inside. And the beauty of it is that the first thing I want to do is share it with everybody and what better time than when I'm standing on a stage and all these amazingly supportive people are there and it's like something just happened and I'm here and I can just, “Here it is,” you know, but I want to share it with you. It was really amazing that you picked up on that and you know we were saying it was a special…a very special night ‘cause it felt that way in my heart so all of that came across you know. Bp: It definitely did come across, it was even more chilling that night than it normally is. Georgia: Thank you so much. Bp: Moving from the stage to the studio, the Dreams of Fireflies EP and your lead vocal performance on “Time You Should Be Sleeping,” was that your first experience in the studio recording with Paul and Dave [Wittman, sound engineer]? Georgia: It was the first time I had recorded something that was a solo thing. It wasn't the first time that I had been necessarily in the studio working with them, but it was the first time I'd been in the studio working on a song that was going to be released now…some of the other things were more like Greek vocals or more of a choral sound and that was my experience in the studio with everyone. [“Time You Should Be Sleeping”] kind of came out of nowhere because I didn't have any expectation and then when they asked me to be involved in the EP it was just very shocking to me ‘cause that was a massive thing. I feel very fortunate to be involved with it. I remember the first time I heard the song I was just like, “Uh, I will have no problem with this one.” ‘Cause it hit me, it got me the first time I heard it. I had tears in my eyes and I looked at Paul and I said, "You always get me. Always, always get me." Bp: How was that song presented to you, was it in a demo form with someone else singing? Georgia: Actually Paul kind of lined out the melody and I had the words in front of me and as I was hearing the melody and I was reading the words it just instantly had me and when songs do that to me I feel like it's almost like a way of letting me know, or letting him know, that this one's a special one to me and I think that if you really love what you're doing then everyone around you will feel that love that you have for what it is you're doing. And so I was really, I mean it was an honor to be a part of that EP. I mean it was just such a crazy thing to be able to say that I was part of that you know. Bp: Does he have you lined up for any lead vocal performances on any of the upcoming projects? Georgia: I hope so. [laughs] I'm sure that whatever he allows me to sing or feels is a good fit…I always trust that he's gonna put something in front of me that he believes is the right kind of character for me because so far I've really felt like each character he's had me play whether it be on the records or live, it's just felt very natural to me. So I definitely would love to be involved in other things moving forward because I always trust his judgment and I'm excited to see what's to come because my character role does change quite often and that's fun for me because there's always something new to look forward to or sometimes it's a bit challenging, but it's exciting because it always keeps me on my toes. Bp: You mentioned the lifts and the dancing and Paul always keeping you on your toes. What was the initial reaction last year when you got to Omaha for production rehearsals and they said, "So during this instrumental number we're gonna put you on lifts and have you gals dancing?" Georgia: Yeah, it was. It was pretty crazy, but I think that it was a good choice that they didn't put us up there while doing the Jam because I definitely am not scared of heights and I like to be kind of living on the edge and taking risks, but I was scared for sure. I was definitely scared on those ones. But it was really fun to be able to try them out. For safety reasons if there's any chance that anyone's gonna be on a lift it's always better to get a feel for it. Bp: Do you get a chance to see the west before you leave Omaha to see the show in full from the perspective of the audience? Bp: [laughs] That must be cool perspective. How do you keep yourself in check and stay grounded, since you do the signing line afterwards and you have hundreds of people coming up and telling you how great your performance was. How do you keep that in check with just staying Georgia and letting it go to your head or becoming an egotistical megalomaniac? Georgia: [Laughs] I really think that the fans are a big part of that. I mean I've never known such supportive, kind, genuine loving fans ever. I've never seen it on TV, I've never witnessed it first hand, I mean it's just we really do have the most incredible, supporting fans ever. I think a really good way to stay grounded on the road is staying in touch with the closest people to you at home that really know everything, all your ins and outs, all your good and bad, and trying to just stay connected to that so it doesn't become just like some dream world and everything at home is kind of put on hold ‘til you get back home. So that definitely helps. Having the family that I have is a blessing. They are really, really incredible and they're very honest with me so if they ever thought that I was being out of line or changing or anything they'd probably be the first to tell me. And also my mom, the first thing she does when I get home off of tour is invites me over and I'm the one that cleans all the toilets at the house. Bp: [laughs] That is a great story! Kudos to your Mom. Georgia: Yeah, I'm thankful. As much as I love cleaning toilets, I'm very thankful for it. Bp: Before we wrap up, tell me a little bit about your recently release single “Little Lady” and what plans you have for 2014. Georgia: Well, I definitely have some exciting things that I want to get out and about and really move forward with the stuff that I have written and new things that I'm working on. I have been writing probably for about four years and it's stuff that I'm really, really excited to share with everybody. I really can't wait and so my goal in 2014 is to just continue to share my heart with all of you guys and collaborate with some other people that have come into my life and really just be full speed ahead. I feel a new year, a new start brings new ideas, new inspiration and this past year since I've turned 21 was a very growing year for me. I did a lot of growing and learning and so I'm really excited to move into a new year feeling really amped up for my music and what I really want to share with lyrics from my heart. “Little Lady” was a song I wrote a few years back and it's a little different from what people are used to hearing me sing and I think that's what's exciting for me. It's new and it's different and I can't wait to just continue to share more stuff with you all and see what you think ‘cause you guys are pretty honest. It means a lot to have you all out there giving me feedback and boosting my confidence and just being so sweet that I can't wait to share that with you. Bp: Well we can't wait to hear it. Bp: Thank you so much for the time this morning and I can't wait to see and hear you tonight. Georgia: I can't wait. I'm really looking forward to it. Thank you so much, Brad. I really appreciate it and I hope you have a beautiful day. I'll see you later. Bp: Thanks Georgia, you too. More in my Trans-Siberian Orchestra Interview series -> here.